Collaborating toward sustainable, resilient, regenerative economies that benefit all communities. CJA is in a growth phase. The work to curb climate change is a big lift. We encourage you to apply to open positions here. 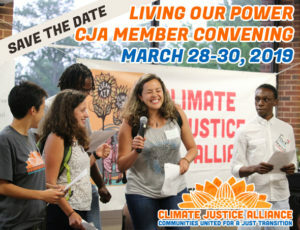 The member groups of the Climate Justice Alliance will converge from March 28-30, 2019 in Albuquerque for the 3rd CJA Member Convening. We have accomplished so much together since we began to fearlessly grow CJA from the bottom up. Want to hear and see the latest work CJA and our members are doing?